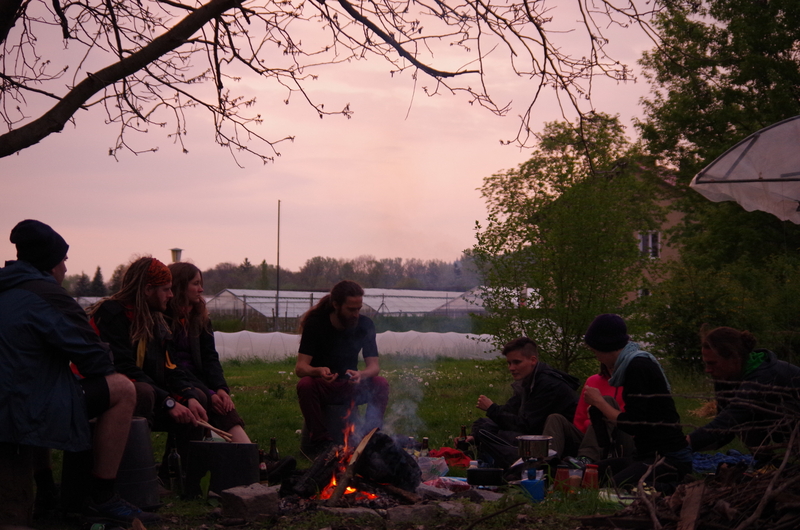 A climate camp in Lusatia, Germany, and the Ende Gelände action caught our interest in spring 2016. They were conducting several protest against the coal mining projects in Lusatia. 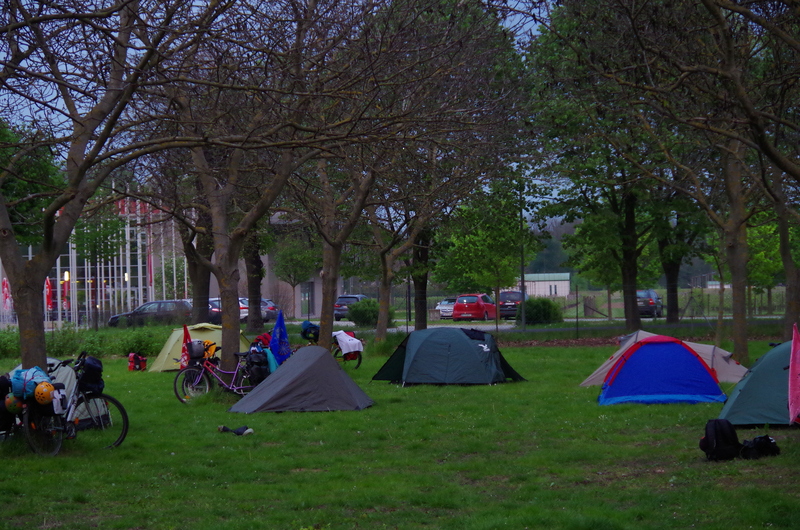 When we heard of groups cycling to the camp from London and Sweden, we decided to organize a tour from Vienna. The route should lead us through Austria, Czech Republic to Saxony in Germany. On the way we visited groups, organizations and individuals being active in social or environmental projects. This was very inspiring. We had a rough start. Already on the first day, we had to deal with bike malfunctions, rainy weather, aching knees and loosing our track. We arrived tired but happy at our first camp, the garden of Arche Noah, a project dedicated to save the diversity of cultivated plants. After a cold night, we headed into the steep hills of Upper Austria. 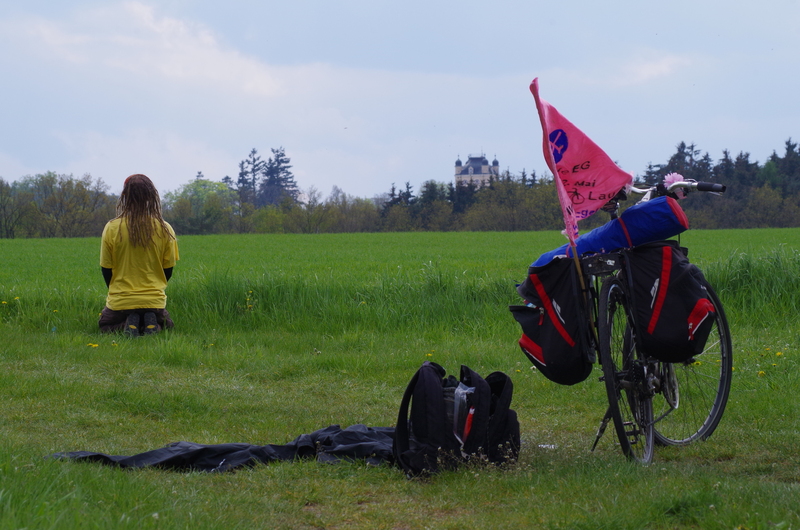 This was one of our longest (100km) and hardest days with more rain and very tired legs. We crossed a training area of the Austrian military and had to deal with their very annoying Eurofighter trainings during our lunch break. And as the road went up and down, so did our emotions and our motivation. We were very happy that a nice dinner and a real bed were waiting for us at GEA Akademie in Schrems and we didn’t have to think about cooking or setting up the tents. The third day was shorter, but unfortunately it was raining the entire day. 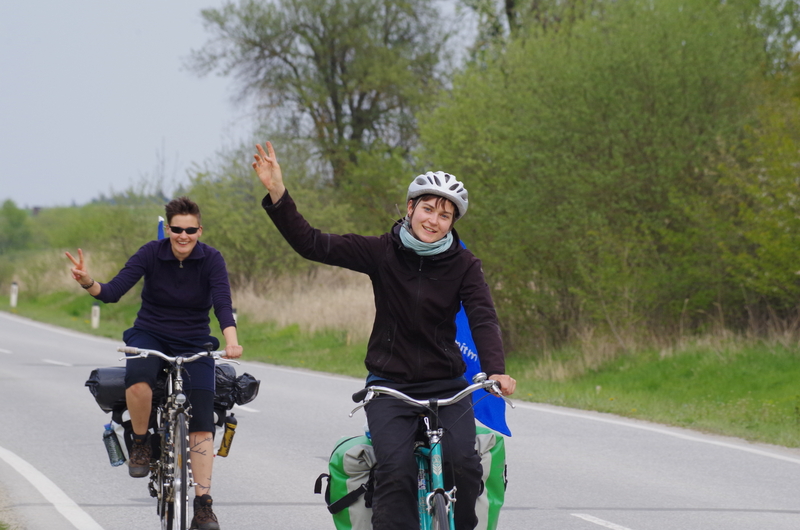 Luckily, we had a warm welcome by Calla, a Czech environmental organization, and OIZP, a citizens‘ initiative for environmental conservation, with tea and cookies. We learned about their work against the nuclear power plant Temelin and the hurdles of protecting the environment in Czech Republic. After a short stop at the power plant in Temelin we went on to our next campsite in Milevsko. It was situated directly at a lake and finally the weather was getting better. With another 100km long day we arrived in Prag, where we had a break day and stayed for two nights at Klinika, an occupied house. In Prag we visited the headquarter of EPH together with the environmental group Limity jsme my. EPH bought the coal mines in Lusatia from the Swedish company Vattenfall. We did a small protest in front of their offices. Back on the road, we went on to Königstein and had a beautiful and romantic campsite in an empty open air cinema theater. Then we left Czech Republic and arrived in Dresden. Here we could sleep in the offices of Greenpeace. 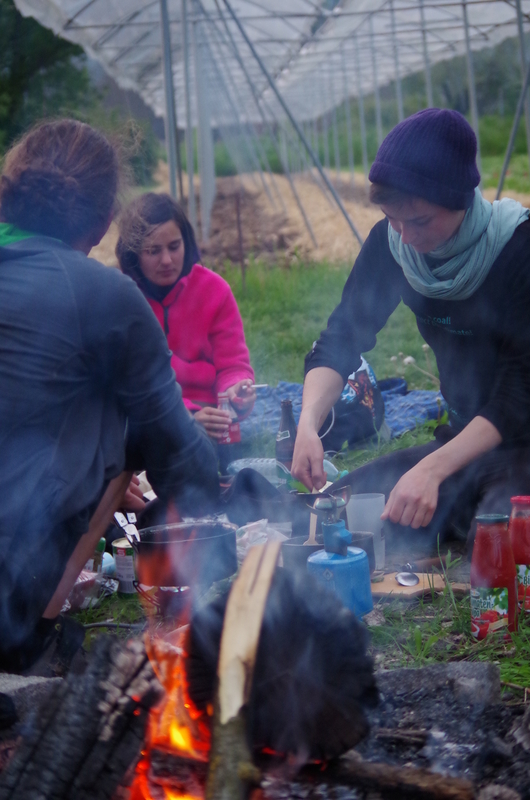 The Greenpeace team organized a wonderfull afternoon with other NGOs and a Küfa (Küche für alle = kitchen for everyone). With a critical mass we rode through the city, promoting the climate camp. There were also talks organized from the green party and an energy cooperative and we could also present our tour. In the evening, there was a public viewing of the movie Disobedience. 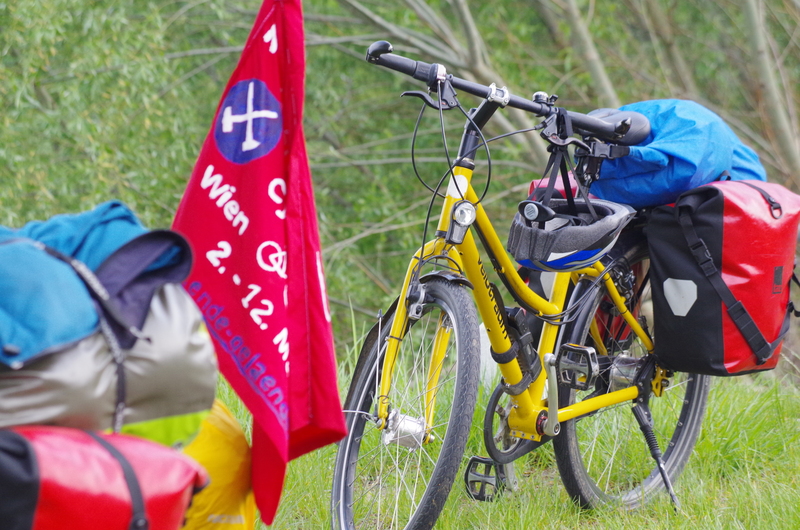 After just one more day of cycling, we finally arrived at the climate camp in Proschim. Needless to say, we were proud of ourselves that we had managed to travel these 600km fossil free with our own muscles doing the work. But we were also eager to do this again. And this is how Cycle for Change was born.